For the first time ever at an ICSOM conference, delegates participated in a community outreach event. Coming together in Philadelphia, Tuesday August 25th on the eve of the official conference opening session, delegates from 12 member orchestras, members of the ICSOM Governing Board, and lCSOM Legal Counsel Susan Martin met at the Broad Street Ministry (BSM), a facility which provides meals and other essential services to those most in need in Philadelphia. At BSM, these volunteers from ICSOM joined with Philadelphia Orchestra musicians, board, and staff members to serve dinner to nearly two hundred people. In addition to those who set up, served, and helped with clean up, musician delegates performed music specially selected for those who might be unfamiliar with classical music. Thanks to Pittsburgh delegate Penny Brill, a pioneer in designing musical programs appropriate for wellness and other social programs, delegates had a wide variety of music from which to select for the various ad hoc ensembles. 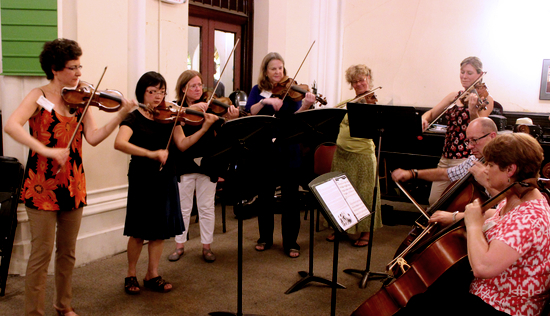 Several Philadelphia Orchestra musicians volunteered their instruments (tuba, viola, and two cellos) and Philadelphia Orchestra violinist Barbara Govatos and Associate Concertmaster Juliette Kang joined the delegates in the music making. In addition to a traditional brass quintet there was a string ensemble and also a mixed ensemble of two cellos, trombone, and tuba. The mixed ensemble played some lively arrangements of Beatles tunes, provided by the Philadelphia Orchestra cello section from their repertoire of cello ensemble works. The idea for a service event to take place in the city of the conference came from the Governing Board and ICSOM Legal Counsel Susan Martin. Their model for the idea stemmed in part from Susan’s experience with legal conventions, where performing a community service event in the city of a conference is common practice. The thought was to select a service event that would highlight the value of musicians to the community. After a conference call with Susan and members of the ICSOM Governing Board, we decided on working with a soup kitchen: the soup kitchen nourishes the body and music nourishes the soul. After some Internet searching, I was delighted but quite astonished to discover that one of the most comprehensive programs for feeding and serving the needy is directly across the street from the Kimmel Center (home of The Philadelphia Orchestra). None of the six resident companies housed at the Kimmel Center had extended a hand to Broad Street Ministry. It was high time to change this unfortunate validation of stereotypes of privilege and poverty and of the concert hall as an isolated temple for society’s elite! I made a site visit with ICSOM delegate and fellow PO cellist John Koen, and we initiated a dialogue with BSM. We were careful to ask if music would be a welcome addition to the meals, and we worked with BSM to design appropriate musical choices and lengths of selections to best serve the needs of their clients, after better understanding their social history and likely trauma profile. When the doors opened to the eager, quite dignified, and most appreciative clients for dinner on August 25th, the musicians were in place as performers as well as servers. The volunteers who participated reported the moment as quite emotionally moving. Delegate Julie Edwards (Utah) said that she encountered one of the clients the next day, while walking to the Kimmel Center, and the client remembered her by name and engaged her in a conversation. It was an inspiring evening of service in the most authentic and genuine relationship of helping and relating to each other. Thanks to all who participated. The BSM service event in Philadelphia will hopefully serve as a template for other like events in the cities where the ICSOM Conference will be held. Sharing our talents through our music making and making a difference in the lives of others is what orchestral ensemble performing is all about. What a joy and privilege to be able to do this with the member delegates from all over the country. The musicians of the Philadelphia Orchestra are grateful to ICSOM for this initiative, as it raised our awareness of our neighbor, BSM. We are in dialogue with them about creating a regular and sustaining presence within their program.